Ireland, 2003, 92 minutes, Colour. 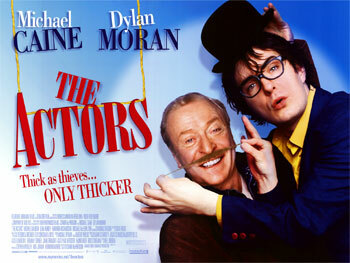 Michael Caine, Dylan Moran, Michael Gambon, Lena Headey, Miranda Richardson, Ben Miller. Directed by Conor Mc Pherson. Conor Mc Pherson is an Irish playwright in his early 30s. Several of his plays, like The Weir, have been staged very successfully in London and New York. He has also written the comedy film, I Went Down, directed a version of Samuel Becket's Endgame and a film from his own script about Dubliners, Saltwater. This time, he has written a comedy based on a story by Neil Jordan. It would be great to be able to say that this is an unmitigated success and an uproariously funny comedy. It's more of a smile comedy and might have benefited by a longer running time to develop the characters and show parts of the plot instead of merely describing them. The basic idea is a good one. What if a ham Shakespearean actor, playing Richard III to poor audiences in a Dublin theatre in a Nazi setting, with Hitler as the tyrannical king, heard about an easy set-up from some criminal types while his doing research for his role? What if he got his friend, who is playing an extra, to pretend to be a bagman and collect money owed before the real thugs turned up from London? Well, it is a great opportunity for Dylan Moran to do a number of clever impersonations. It gives an opportunity for Michael Caine to do a really terrible Richard III, display a talent for cowardice and even impersonate Miranda Richardson as the London gangland boss. So, plenty of opportunities. However, the whole thing is slight and the whole thing rather ordinary, despite Moran's talent, Caine's great professionalism and some hamming from Michael Gambon. Entertaining but not special. 1. The talent of Conor Mc Pherson as playwright, screenwriter, director? The story from Neil Jordan? A comedy in five acts - the focus on the stage and its contrivances? The structure of the film? 2. The picture of Dublin, the city, the old theatre, the lavish castle, the pubs, the musical score and songs? 3. The title, the focus on Tony and Tom, the ironies? Tony unable to improvise though performing on stage, Tom bad on stage but rising to the occasion, especially in impersonations? 4. The sequences from Richard III, the parody, the small audience, the mistakes and disasters? The Hitler setting? 5. Michael Caine and his style as Tony O'Malley, ham actor, temperament, friendship with Tom, researching his role, the idea for the set-up? Trying to persuade Tom, Mary and her structuring of the story, understanding all the angles, instructing both Tony and Tom? The complications, his falling for Dolores, believing she was in love with him? The invention of Clive, the complications and having to change the plan, Mary's advice? Tom and his persuading Barreller to believe him? The gangster boss and her coming from London, discovering she was a woman? Tony and his disguise, betraying Tom? At the castle and the pretended shooting? The confrontation between the boss and Tony, their believing he was the better actor than Tom, believing that he was to blame, his injuries? His award - and his temperamental behaviour during the award - and everybody rushing out to see the commercial with Dolores? 6. Tom, the focus of the film, his lack of success as an extra, his auditioning for the sausage ad and his inability to be convincing? His house being burnt down, refusing Tony's suggestion, then agreeing, his disguise as Clive, his rising to the occasion? Dolores infatuated by him? Barreller believing him? His then pretending to be the killer, his taking them in again, eating the popcorn, his enjoyable performances? The arrival of the real Clive? His not believing the impersonation, his believing Tom in his disguise? Sending him off to the island? The set-up for his death, with Dolores in the castle, his wanting to tell her the truth, in hospital, her visit? Her seeing through him? The finale in the theatre, the boss and the gangsters thinking he was so bad that he couldn't be the impersonator? The happy ending with Dolores? 7. Mary, writing in the schoolroom, the five acts, her advice, plans, her exasperation at the performances? Tony and his exasperation but having to defer to her? 8. Michael Gambon's performance as Barreller, hamming it up, the financial situation, love for Dolores, the explanation of his slow sons, falling for the deceit? His being a good man at heart, confronting the boss, enjoying the finale? 9. Dolores, her relationship with her father, her brothers? Her attraction to Tony, to Tom as Clive? The dancing, the karaoke song? The death in the castle, going to the hospital, seeing through him, her own tricking him? The irony of her getting the TV commercial? 10. Clive, the gangster, his being deceived by Tom as Clive? His being sent to the castle, his return, the other gangsters, the boss? The build-up to the shooting, the theatre, his not believing Tom as an actor? 11. The boss, Miranda Richardson and her style, arrival in Dublin, the confrontation, with Michael Caine disguised? His being unmasked with his hair on fire? The theatre, their believing that he was the impersonator? 12. The theatre world, the mistakes, the members of the cast, the prompters? Tom and his arriving late, trying desperately to get into the theatre in disguised and being refused? The awards and the parody of the Oscars? 13. A credible situation for a scam, the characters and acting in order to achieve the scam? All things ending well despite all the complications and disasters?